All of our offerings challenge students both to confront the foreignness of these ancient cultures and to explore the profound connections between them and our own. 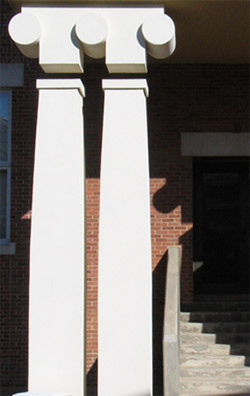 The “Ironic” columns of Lawrence Hall by Charles Moore, 1986. Classical studies at Williams include a broad range of courses in the Greek and Latin languages and the civilizations of the ancient Mediterranean. Courses in Greek and Latin enable students to increase their linguistic facility as they study important authors, subjects, and periods and develop a variety of methodological skills. Courses in Classical Civilization, in which texts are read in English translation, provide introductions to the literature, history, mythology, art, archaeology, religion and philosophy of ancient Greece, Rome, and the larger Mediterranean, as well as opportunities for more advanced or specialized study. Our curriculum, like the events we organize and the cooperation we enjoy with other departments and programs, reflects the interdisciplinary character and expansive range of classical studies. Many of our courses emphasize a single disciplinary approach (literary or historical, for example), while others integrate several approaches. Many of our courses are focused entirely on ancient Greek and/or Roman culture, while others expand their focus to include other ancient Mediterranean cultures or later periods. All of our offerings challenge students both to confront the foreignness of these ancient cultures and to explore the profound connections between them and our own.